I'm thinking this on really fits the ticket. I just have a few questions. 1) Can we get some pictures of the sights? 2) Do they have to be removed or do they interfere when you mount other sighting options to the rail? 3) Will this accept the Ruger factory 10 round rotary magazines? 4) When will this be available? 5) Any plans for a forend with rails or sights? I will try to get a picture of the sights up today. built to accept most 10/22 magazines. The X-22P Series firearms require Steel Lip Magazines with ejectors for proper performance. The Factory mags will work there is just not alot to hold on to when pulling the mags back out of the firearm. The X-22P are available now. With a short barrel leangth of 4-3/8 its best that your hands stay away form the end of the barrel.. I hope this will help you and I do apologize for not getting back to you sooner..
thanks for the reply... figured you guys were just busy. also threading and bipod options would be cool to see for this. I like this better than the 10/22 charger which was orginally i planned for but there are trade offs both ways I guess. I'm saving up for the X-22P. It looks like the perfect trainer for the PDW type weapons that are on the market now. If I like it, I will buy the 5.7 pistol as well. The only thing that worries me, is that I've seen a lot of negative comments about your customer service online - like people who send their gun in to get fixed and just get refunds for their guns? What is the other side to these stories please? A lot of them involve the 17HMR pistol, which I see you have now dropped, if that helps? ChalupaCabras wrote: I'm saving up for the X-22P. It looks like the perfect trainer for the PDW type weapons that are on the market now. The X-22P would be a great PDW trainer! In regards to our customer service we would never take a firearm in on repair and just issue a refund without consulting with the customer first. In both of our firearm lines we offer a lifetime warranty to the original retail purchaser. We are a small family owned and operated business and have been that way for over 30 years. Yes sometimes things happen and a customer cant be satsified, but we always stand behind our products 100%. There is alot of inconsistent 17HMR ammo that is manufactured today, and it shows up more frequently in all the semi autos. This why we have got in to the 5.7 round. I hope that this will ease your conserns about us. Thank you for your reply! Sorry it took me so long to get back to the discussion. I'm having trouble finding any of your pistols for sale. I would like to purchase one, but the lack of availability is hampering me. How can i obtain one of your X-22P pistols? "Excel ArmsThere is alot of inconsistent 17HMR ammo that is manufactured today, and it shows up more frequently in all the semi autos. This why we have got in to the 5.7 round. I remember Magnum Research getting out of the semi-auto 17HMR business back in 2009. Do not use 17 HMR ammunition in semi-automatic firearms. Use of 17 HMR ammunition in semi-automatic firearms may result in serious personal injury or property damage. 17 HMR ammunition is manufactured in accordance with standards issued by the Sporting Arms and Ammunition Manufactures’ Institute (SAAMI). Subsequent to the design and introduction of 17 HMR ammunition to the market, 17 HMR semi-automatic firearms were introduced by various firearm manufacturers. Those firearms have proven to be incompatible with 17 HMR ammunition. 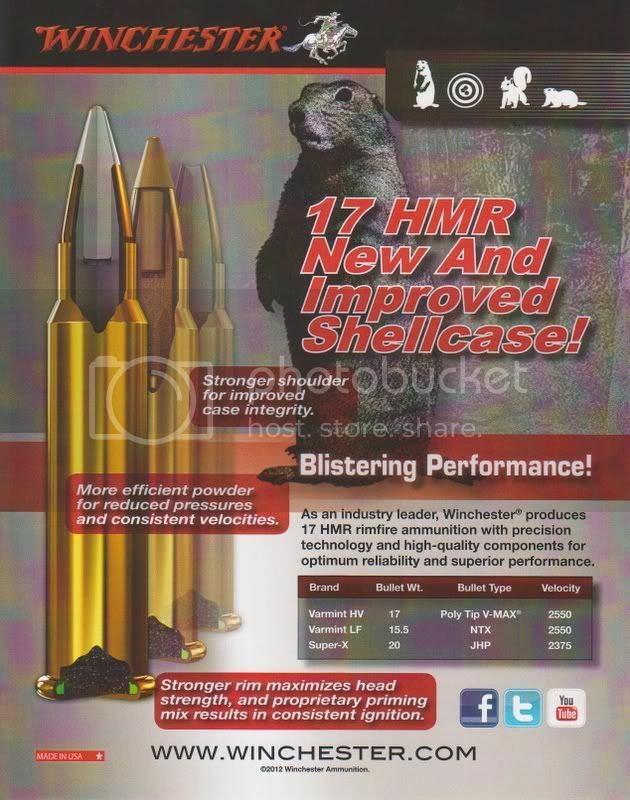 17 HMR ammunition is suitable for use in quality firearms in good condition that are not semi-automatic. It has come to our attention that certain lots of .17HMR ammunition may exhibit performance problems. These problems could result in damage to your rifle and may be capable of causing injuries to shooters or bystanders. Although performance of ammunition is outside the control of Magnum Research, we take safety concerns seriously. ChalupaCabras wrote: Thank you for your reply! Sorry it took me so long to get back to the discussion. You can purchase direct from us and we can ship to your local FFL dealer for the transfer. We were exhibiting at the NASGW show last week in Reno NV, Where we picked up some info on WINCHESTER's NEW .17HMR. They are stating a "NEW AND IMPROVED SHELLCASE" with "MORE EFFICIENT POWDER FOR REDUCED PRESSURES AND CONSISTENT VELOCITIES" also "STRONGER SHOULDER FOR IMPROVED CASE INTEGRITY". WINCHESTER has stated that they are manufacturing this round, not CCI who currently produces there own .17HMR and for other companys in .17HMR on the market. As of this morning we have been in contact with WINCHESTER AMMUNITION and are working togeather on testing this NEW .17HMR in our semi auto firearms.